Standard package with plastic film ,we can also pack it according to your requirements with wooden case or steel frame. 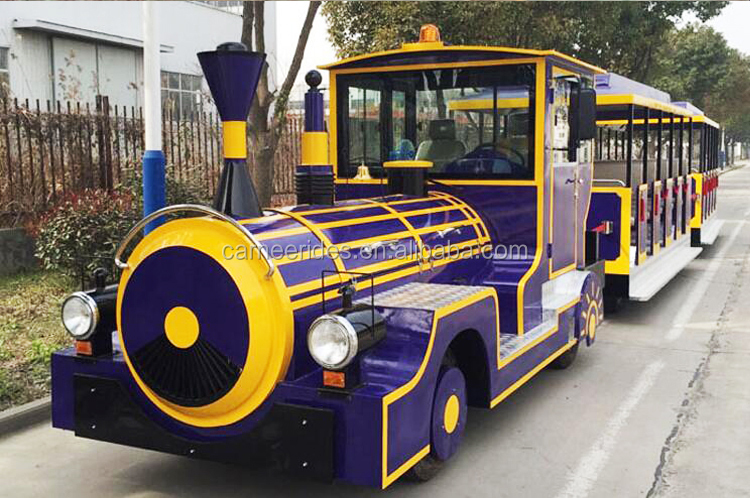 Electric train is a kind of popular amusement park train usually applied in theme park, scenic aera,shopping mall,real estate center, etc . 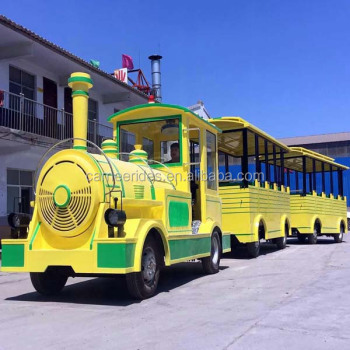 It usually consists of a locomotive and several train carriages which are connected by a hinge. And each carriage is mounted with four pneumatic tires without track for running. 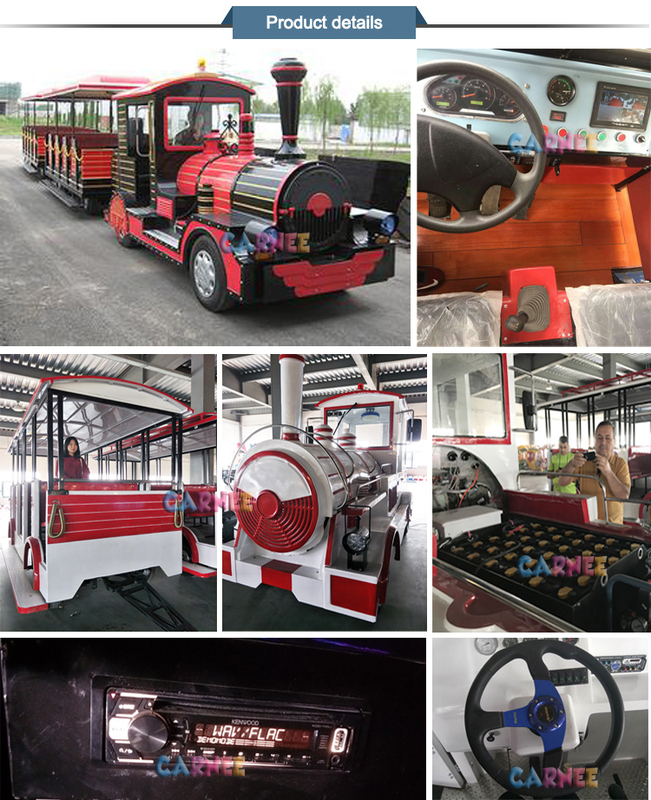 A commander can drive the locomotive to drag tourists in the following carriages oncement road, asphalt road or indoor playground. 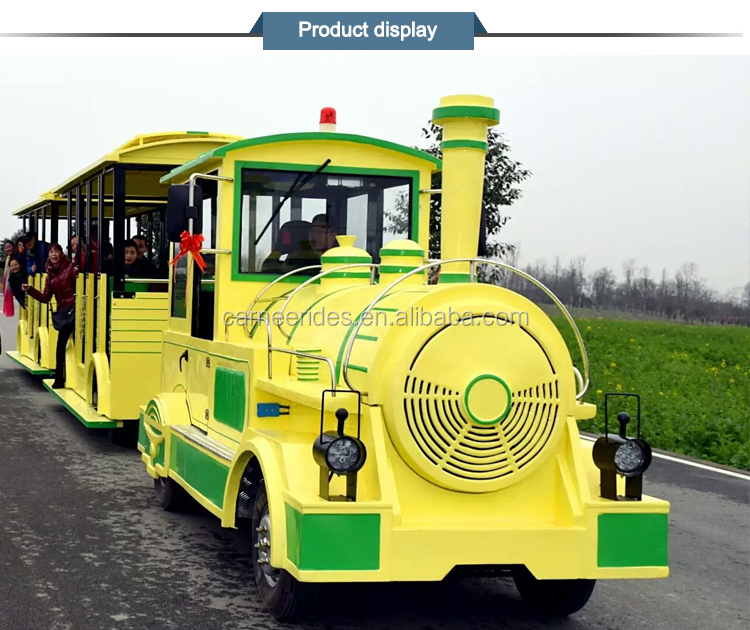 As a transportation tool and tourism tool , trackless train is one perfect choice for visitors who expect more fantastic scene or are reluctant to walk due to tiredness. 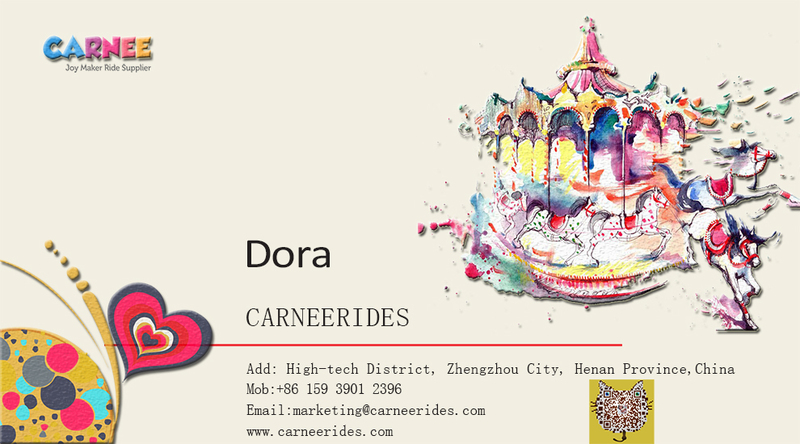 In addition, it are an important tourist attraction due to special shapes and passenger-carrying functions. 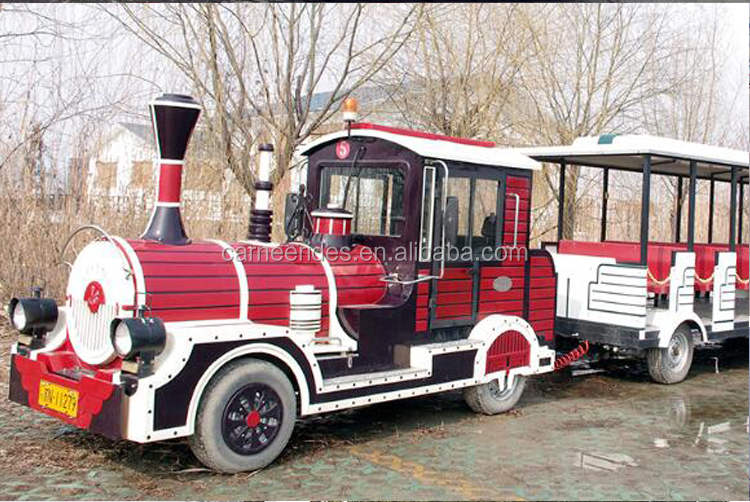 Our tourist train can hold 42 person. 1. FRP Cabins are solid. It will be unfading with imported automobile paint. 2. 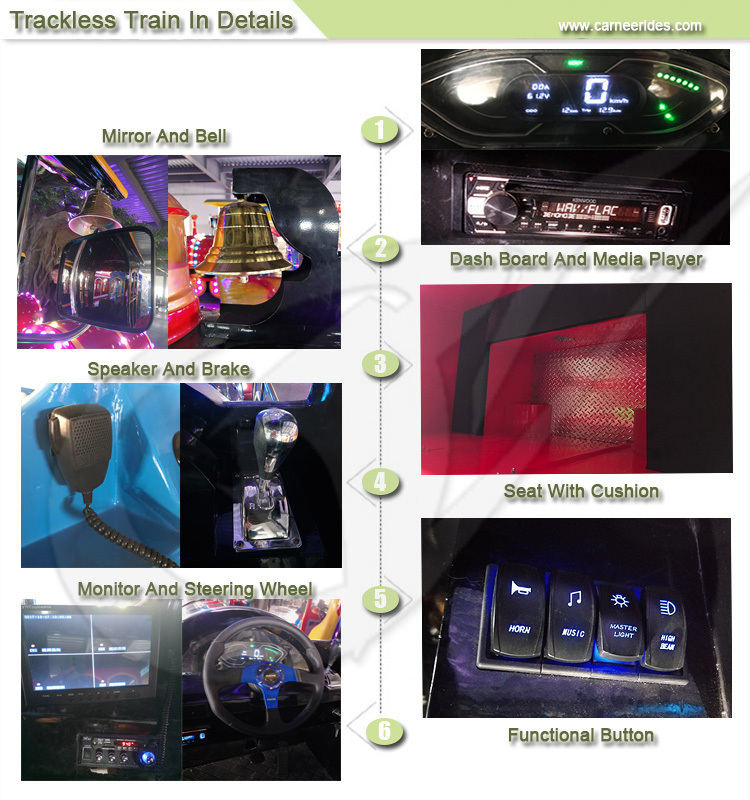 The latest design and unremitting innovation of the cabin is attractive. Decorated with colorful lights ensure the beautiful surface. 3. Focus on mechanics makes kids more comfortable to sit in. It will be tested before delivery. 4. Good technic of the track (motor transmission system) ensure the lower noise. 5. Smooth surface of the track ensure the well running of the wheel. 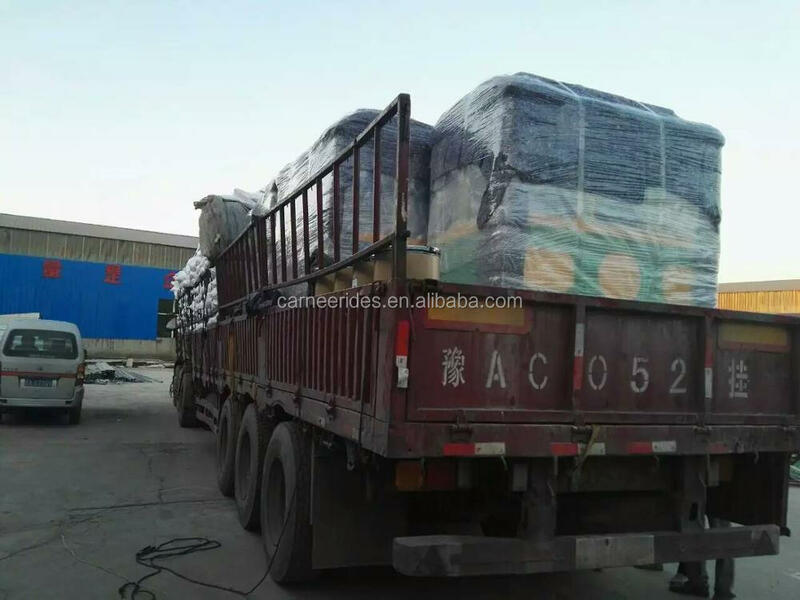 The length and size can be designed as customers site situation. 1. the material is double-layer fiber glass with wood inside. 2. Wooden floor or aluminum floor for your choose. The wooden floor is water resistant, high temperature resistance,not easy to deform and wear-resisting. 3. The ceiling material is also fiber glass. 4. Our steel is thicken. The whole train is more stable. 5. Using the automatically air-cut brake. 6. Every wagon has the braking system, and the control system is in the locomotive. This will lead to quicker braking. 7. You can choose the gel coat painting technology, making the painting more bright and smooth. 1. According to your requirements and needs for product design. 2.We offer profound marketing strategy help clients make profit in short time. welcome to call me any time. 1. Provide install CD products operation manual. 2. Professional technician guide rides assemble at your place if you need. 3.Guarantee is 12 months, during this period the unartificial faults of all components is free to change. Sea worthy package cotton fabric & plastic film wooden case packing. Or pack according to your requirement . 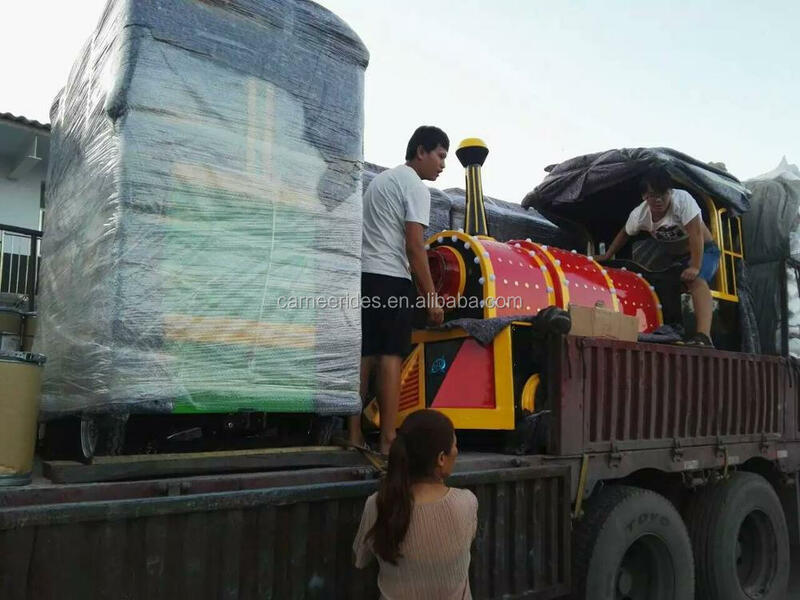 Zhengzhou Carnee Trading Co., Ltd. is engaging in the filed of entertainment equipment, from the traditional amusement park rides to the new VR simulators and the outdoor/indoor skydiving wind tunnel. 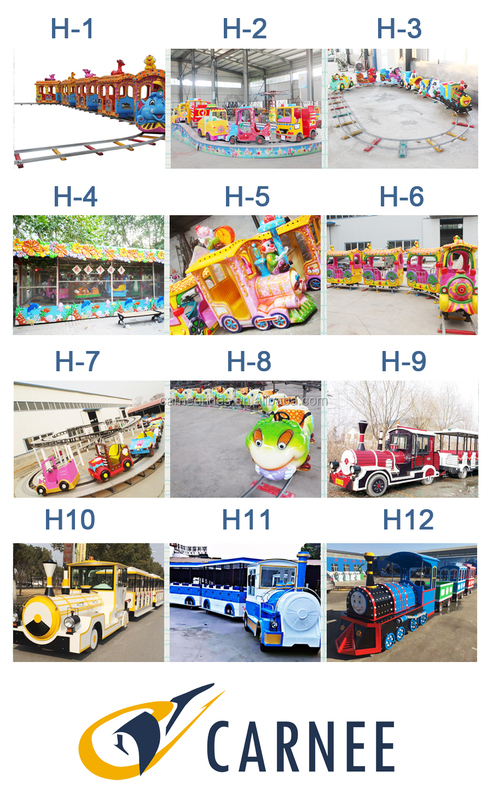 These items are widely used in various amusement park, shopping mall, hotel, plaza and family entertainment center, etc. 1. Park rides: carousel series, self-control plane series, sighting car series, flight tower series, scooter series, train series, battery car series, etc. 2. Skydiving wind tunnel: outdoor,indoor,and mobile wind tunnel. Our company has a completed one-stop service system.